Stephen Paulus was a prolific American composer of classical music. He wrote over 600 works for chorus, opera, orchestra, chamber ensemble, solo voice, concert band, piano, and organ, receiving premieres and performances throughout the world as well as a Grammy nomination for Best Contemporary Classical Composition in 2015. His musical style has been described by The New York Times as “lush and extravagant,” and critics from the New York Times, Los Angeles Times, Cleveland Plain Dealer Opera News, and many others have praised his work. The New Yorker described him as a “bright, lyrical inventor whose music pulsates with a driving, kinetic energy.” He was a recipient of both NEA and Guggenheim Fellowships. With 55 orchestral works to his credit, Paulus served as a Composer in Residence with the orchestras of Atlanta, Minnesota, Tucson and Annapolis. Conductors who premiered his works include Osmo Vänskä, Christoph van Dohnanyi, Kurt Masur, Sir Neville Marriner, and Leonard Slatkin. 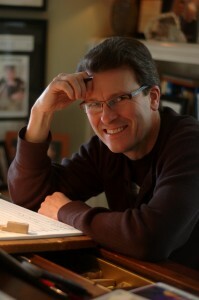 Orchestral commissions include a violin concerto for the Cleveland Orchestra and William Preucil, a jazz concerto co-written with his son, Greg, for the Minnesota Orchestra as well as organ concertos for the Phoenix Symphony and the Portland (Maine) Symphony.Beginning in 1979, fresh out of graduate school with a Ph.D. from the University of Minnesota, he was commissioned by Opera Theatre of Saint Louis and later went on to write a total of 12 operas with performances coming from Boston Lyric Opera, Washington Opera, Minnesota Opera, Sacramento Opera, The Berkshire Opera Company, and others. Paulus wrote over 400 works for chorus ranging from his Holocaust oratorio, To Be Certain of the Dawn, recorded by Minnesota Orchestra on the BIS label, to the poignant anthem, “Pilgrims’ Hymn,” sung at the funerals of Presidents Reagan and Ford. His works have received thousands of performances and recordings from such groups as The New York Choral Society, L.A. Master Chorale, Robert Shaw Festival Singers, VocalEssence, Dale Warland Singers and countless others. Notable works for vocalist and orchestra include commissions for Thomas Hampson, Deborah Voigt, Samuel Ramey and Elizabeth Futral. Instrumental soloists who have performed Paulus’ works range from Doc Severinsen and Leo Kottke to Robert McDuffie, William Preucil, Lynn Harrell and Cynthia Phelps. Paulus was a passionate advocate for the works and careers of his colleagues. In 1973 he co-founded the Minnesota Composers Forum, now known as the American Composers Forum, the largest composer service organization in the U.S. He also served as the Symphony and Concert Representative on the board of ASCAP from 1990 until 2014.